I made a joke on the recent podcast about this team coming down here with 30% more red blood cells than us, and it really is a thing. We went to COS two years ago, and the elevation gain is a massive advantage to them. That said, when they last visited, we managed to eek out a 2-1 win in what was to be Dale Schilly’s last victory. 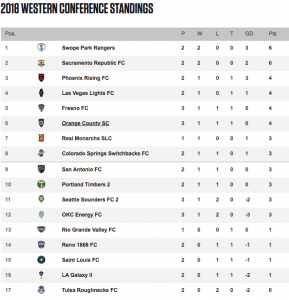 I have to be honest, I haven’t seen either games the Switchbacks have played and the results so far don’t leave me quaking in my boots. 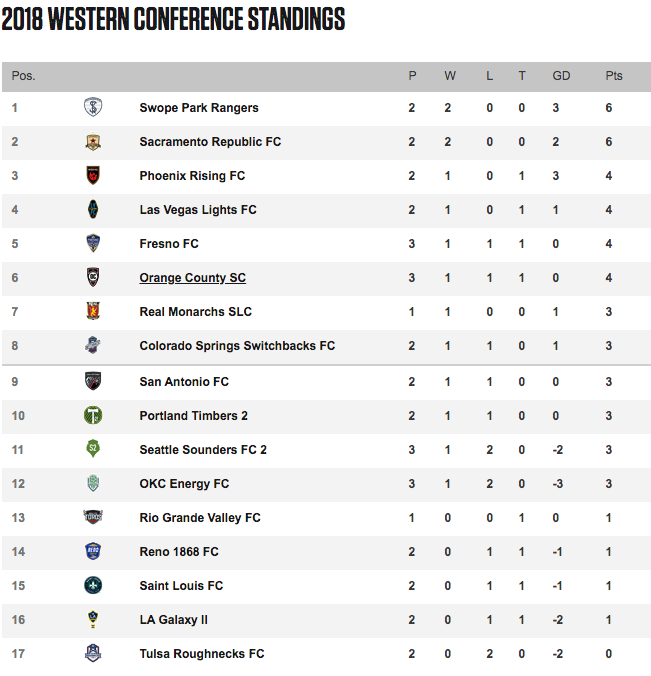 A win against Los Dos and a home loss to Portland Timbers 2 hasn’t exactly set the world on fire. I do think their forward Marty Mayben is a handful; he will look to pressure our defenders and goalkeeper every chance he gets to force an error. The first two years in the league Trittschuh put together a really good team that made the playoffs twice in a row; last year, however, was a lean year for them and I’ve not seen much to suggest they’ve improved. I just hope they don’t leave me eating humble pie around 5:45pm on Saturday. This week is the Colorectal Cancer Alliance. 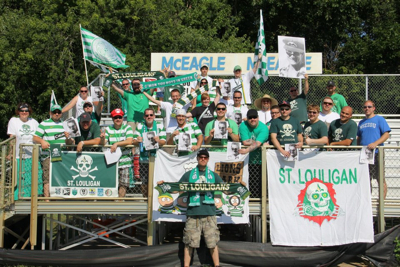 This one is special to us: a founding Louligan, Casey Blick, was taken from us in 2012 by Colon cancer, and a current member’s wife is battling the disease. March is colon cancer awareness month; wear your blue Louligan or STLFC gear to support the cause while supporting our team. Let’s kick off the season with a great donation to the cause! Drums and capos: We march in 1/2 hour before kickoff. Anyone can join the march in! Drummers usually need assistance carrying in the drum stands, so if you can help out, see them as they organize prior to the march. And be careful on the wet stands, so you don’t slip and die. But that’s no excuse for not chanting. Tailgate: The tailgate will be doing pulled pork and Easter ham, with sides. A recommended donation is $5; you can pay them cash, or pay at the merchandise stand. Gran Cruzin Cigars will also have the mobile cigar lounge at the tailgate! 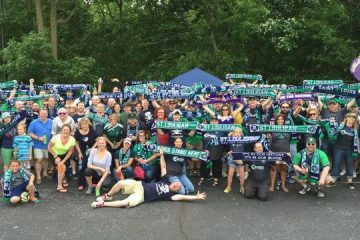 Merchandise: We will have the 2018 Louligan scarves and the 2018 This Is Silly! Podcast scarves. if you pre-ordered one, you’ll be able to pick it up. If you didn’t and you want to get one, we will have extras for sale. $20 per scarf, cash or credit. Tifo: We do have a tifo for this game. 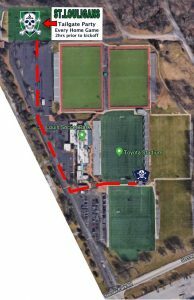 If you are in Section 8, be aware of the raising of the tifo and help out in passing it back, etc. The red line will be the march to the game. The march starts 30 minutes before kickoff (3:30pm).